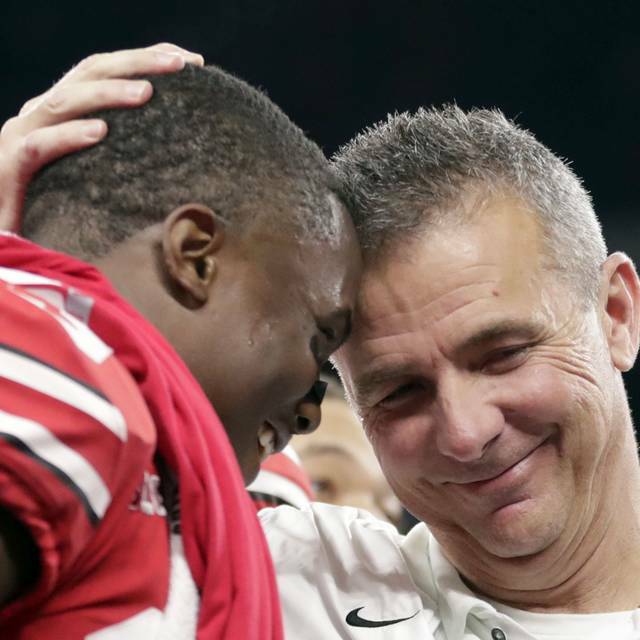 Ohio State coach Urban Meyer and wide receiver Terry McLaurin, left, celebrate after defeating Northwestern in the Big Ten championship. COLUMBUS — Urban Meyer, the highly successful coach who won three national championships and sparked controversy and criticism this season for his handling of domestic violence allegations against a now-fired assistant, will retire after the Rose Bowl, the university announced Tuesday. A news conference was scheduled for later Tuesday during which Meyer will formally announce his retirement and co-offensive coordinator Ryan Day would be named the program’s 25th head coach. Ohio State didn’t immediately say why Meyer was stepping down after seven years at Ohio State, but the 54-year-old coach has previously cited health concerns. He has what is called an arachnoid cyst in his brain that causes severe headaches. Meyer had shown obvious effects of being in pain on the sideline this season. He also was heavily criticized for what some saw as overly lax treatment of now-fired assistant coach Zach Smith, who was accused by his ex-wife of domestic abuse. Meyer said he knew about the accusations against Smith — grandson of former Ohio State coach Earle Bruce — but wasn’t sure they were true and kept Smith on his staff because no criminal charges were filed. The university cited that lapse in suspending Meyer for the first three games of the season after an investigation. A detailed report issued by an investigative committee left a lasting stain, detailing behavior by Meyer that could easily have taken down a coach of lesser stature. The investigation showed that he tolerated bad behavior for years from Smith, including domestic-violence accusations, drug addiction, lies and other acts that directly clash with the values Meyer touts publicly. The Buckeyes’ strong finish this season belied on-the-field problems that made for a stressful season for Meyer and his staff. He lost star defensive end Nick Bosa to an early season-ending injury, and the Buckeyes’ defense never fully recovered. During his suspension, the team was run by Day, the co-offensive coordinator and quarterbacks coach. He’s a second-year Ohio State assistant who had never before been a head coach. The team alternated expected blowout wins with puzzling play that included a pair of one-point wins (Penn State, Maryland) and a closer-than-expected win over a struggling Nebraska team. A shocking blowout loss at unranked Purdue on Oct. 20 pushed Ohio State to the fringe of the national championship chase and prompted all sorts of questions about Meyer’s future. Shortly before Halloween, Meyer addressed speculation that he could step down at the end of the season, saying he felt fine and definitely would be back next year. Ohio State followed that with five straight wins, including a rout of archrival Michigan that gave the Buckeyes another division title and a win over Northwestern in the Big Ten Championship. Meyer has piled up wins at Ohio State after a similar run over six years at Florida that included two national championships. After stepping down at Florida due to stress-related health concerns, he took the Ohio State job before the 2012 season after Jim Tressel was forced out for lying to the NCAA amid a memorabilia-for-tattoos scandal. It appeared to be a dream job for the Toledo native and success quickly followed. He started his head-coaching career at Bowling Green in 2001 and moved on to Utah two seasons later before taking the Florida job in 2005 and rocketing to the top of the college football coaching ranks, a peer of Alabama coach Nick Saban in terms of respect and ability. Read more about this story in Wednesday’s The Lima News and later today on LimaOhio.com.